Corneal transplant is a surgical procedure used to replace a portion of a diseased or damaged cornea with a healthy one. The cornea is the clear, outer surface on the front of the eye. It is less successful for those who have corneal infection and severe injury, like a chemical burn. Your ophthalmologist may do a physical exam and blood tests. Talk to your doctor about your medications. Also, discuss any herbs or vitamins you take. You may be asked to stop taking some medications up to 1 week before the procedure. Arrange to have someone drive you home. Use any eye drops as instructed by your eye surgeon. The day before, do not eat or drink anything after midnight unless told otherwise by your doctor. The procedure will be done under a surgical microscope. The damaged part of the cornea will be cut out. The new cornea will then be placed in the opening. The new cornea will be fastened with very fine stitches. Finally, a patch and shield will be put over the eye. There is another technique called Descemets stripping endothelial keratoplasty (DSEK). 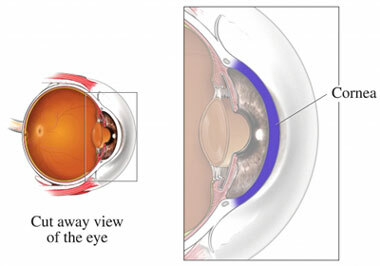 DSEK is used for some types of cornea transplants. It may result in shorter recovery time and better vision. With this technique, the doctor removes a much smaller part of the cornea, compared with older procedures. You will most likely go home after a few hours in the recovery area. Vision may initially be worse than before your surgery before your eye adjusts to the new cornea. It may take several months for it to improve. Stitches are usually left in place for several months. Regular follow-up visits will allow the doctor to monitor how the eye is healing. Do not drive until your doctor says you can. Corneal transplants. National Keratoconus Foundation website. Available at: http://www.nkcf.org/corneal-transplants. Accessed December 14, 2017. Facts about the cornea and corneal disease. National Eye Institute website. Available at: https://nei.nih.gov/health/cornealdisease. Updated May 2013. Accessed December 14, 2017. Frequently asked questions. Eye Bank Association of America website. Available at: http://restoresight.org/wp-content/uploads/2015/07/Frequently-Asked-Questions.pdf. Accessed December 14, 2017. Williams K, Irani Y, Klebe S. Novel therapeutic approaches for corneal disease. Discov Med. 2013 May;15(84):291-9. Available at: http://www.discoverymedicine.com/Keryn-A-Williams/2013/05/24/novel-therapeutic-approaches-for-corneal-disease/.. Accessed January 3, 2018.